If you venture deeply enough into the bowels of the internet, you can find some pretty shocking stuff. But you barely have to scratch the surface to discover the world of pro-ana "thinspo" blogs — online forums where women with eating disorders commiserate and encourage each other with pictures of emaciated women and tips on how to most effectively starve oneself. And the latest iteration of the pro-ana thinspo blog is the Pinterest pinboard. But what about Pinterest is so attractive to the pro-ana community? And should Pinterest be doing something about it? Since the site was launched in March 2010, Pinterest's membership has swelled to over 10 million users. Most boards highlight recipes, coveted clothes, wedding reception ideas involving superfluous chalkboards, and Ryan McGinley-esque pictures of hipsters running through fields carrying sparklers. But for the pro-ana community, the site's format has leant itself remarkably well to crafting "thinspo" pinboards. "Thinspo," for the uninitiated, comes from the term "thinspiration," meaning an image or saying that inspires a person to want to be thin. And while some pictures tagged as "thinspo" are particularly ripped women washboard abs; in others they're thin, emaciated, and bony — firmly into pro-ana (popular internet shorthand for pro-anorexia) territory. On Pinterest, users who have crafted this type of "thinspo" board seem to favor jutting hip bones and collar bones, thin upper arms, visible ribs, and legs that don't touch at the top. A quick search of the site reveals hundreds of these boards full of pictures of coveted body parts, rarely with a face attached. In some cases, seriously fucked up text is superimposed over the image — think "Nothing tastes as good as skinny feels," but with a cutesy font that would be at home inside a child's birthday card. Claire Mysko from the National Eating Disorders Association says that Pinterest is a format that's attractive to the pro-ana community because it's both visual and highly interactive; young women (and some men) suffering from an eating disorder or teetering on the brink of disorder crave the unique combination of visibility and anonymity offered by the site. 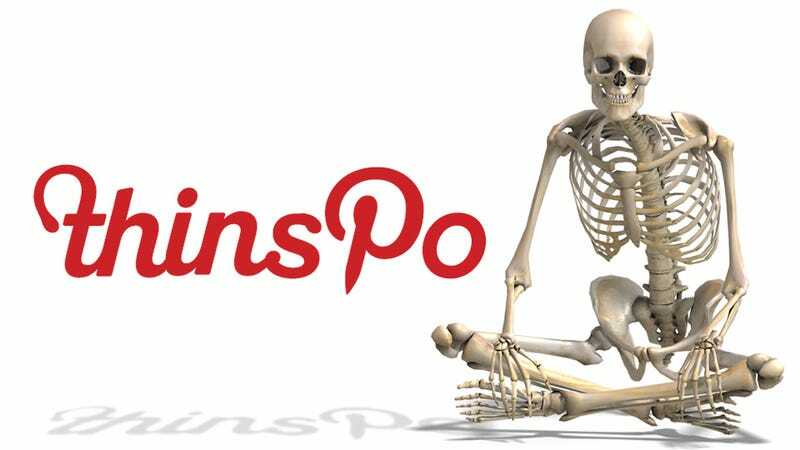 Pinterest users can swap photos of their most enviable shoulder blades in a supportive "community" of like-minded people, but because it's on the internet they can do it from behind the protection of an anonymous handle. ED sufferers often crave validation but lack support in their immediate circles, Mysko explains, but on Pinterest, "they're finding it in a very dangerous and self-destructive way." Pinterest isn't the only high tech enabler for the pro-ana community. According to The Fix, smartphone aps that allow users to count calories taken in and calories burned give ED sufferers instant access to numbers over which they can newly obsess. One therapist lamented that the digital age has given her patients more opportunities than ever to access information that can help them live disordered lifestyles more efficiently. Some blogging platforms have taken an actively anti-self harm stance. Tumblr, for example, banned self-harm blogs (including forums with a pro-ana message) last month after working with NEDA to develop a new user policy. Now, Tumblr users who search for certain pro-ana terms will be redirected to information on how to seek help. The organization has also worked with Facebook in helping staff identify red flags and respond in a constructive way. The aim isn't to remove all pro-ana material from the internet; that would be an unwinnable uphill battle. Instead, Mysko says that she hopes policies like the ones at Facebook and Tumblr are able to redirect men and women heading toward eating disorders to seek help. Further isolating sufferers of already-isolating eating disorders isn't constructive; "Ew, gross!" comments on the more disturbing thinspo pins aren't helping. Shame is the most commonly deployed and least effective measure in trying to convince others to change their bodies. In response to the sudden outpouring of opportunities for young people to become entrenched in eating disorders offered by the internet, NEDA has launched a site of its own. Called Proud2bme, the site is modeled after a popular online forum in the Netherlands that has become one of the country's most visited health sites. The site's aim is to provide support for teens suffering from eating disorders on down to teens suffering feeling crappy about themselves as they try to exist in a body-obsessed society. Forum moderators are often recovered ED sufferers who undergo the same training as NEDA's help line staff, and there's no body snarking, talk of willpower, or posting specifics about weight allowed.